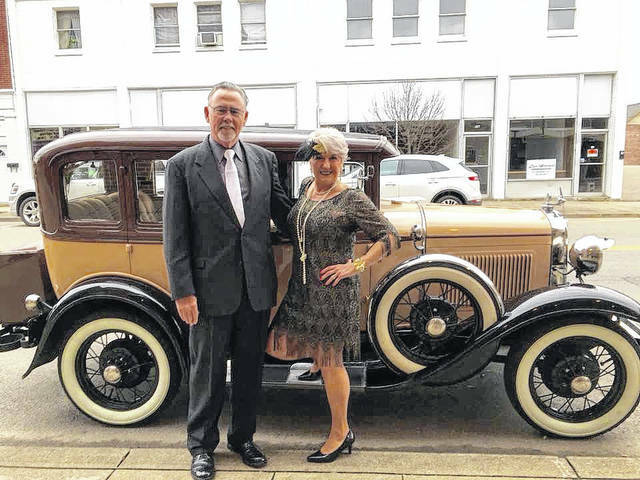 Cindy Sexton, chair of the French Art Colony Board of Trustees, and her husband, Rick, are pictured in front of an antique car at last year’s “Roaring Twenties” event. GALLIPOLIS — The second annual “Roaring Twenties” event hosted by the French Art Colony, will be this Saturday evening, April 7, at the Colony Club. This is the FAC’s major fundraising event of the year and promises to be a great evening of fun, entertainment by Jan Haddox, heavy hors d’oeuvres, with a live and silent auction valued at over $20,000. A cash bar with themed drinks will be available. The live auction, beginning at 8 p.m., will feature five vacation getaways, available for summer and fall travel. Destinations include Put in Bay, Ohio, Snowshoe, West Virginia, Garden City, South Carolina, Emerald Isle, North Carolina, and a one, one-night stay in a luxury room at the Mardi Gras Casino and Resort in Cross Lanes, West Virginia. Also, two tickets will be featured to the Broadway Tour of “The King and I” in Columbus, four tickets to the Robin and Linda Williams Concert at Fur Peace Ranch, two tickets to an Ohio State football home game, multiple themed baskets and more. The silent auction, with bidding available throughout the evening until 9 p.m., includes original artwork, fine jewelry, antiques, collectibles, household items, restaurant certificates, local services and more. Both the live and silent auction items have been donated by area businesses and individuals in support of the FAC’s broad array of programming, classes, art exhibits, “StoryWalk” and special events, promoting the arts. A highlight of the evening is the Roaring Twenties’ attire, worn by many of the guests. This, along with the décor of the Colony Club, enhance the theme of the party and provide an exciting 1920’s atmosphere. Tickets are $25 each and tables may be reserved in advance for $120 – $150. A limited number of tickets may also be available at the door. Doors open at 6:30 p.m.
For reservations, or more information, please call the French Art Colony at(740) 446-3834, or visit www.frenchartcolony.org. The Ohio Arts Council helps fund these programs with State tax dollars to encourage economic growth, educational excellence and cultural enrichment for all Ohioans. Information submitted by Marianne Campbell on behalf of the FAC.